A roof that uses solar energy three ways – solar power panels, solar hot water heating, and a skylight. This is the first part of a series on solar energy. Please visit our sections on energy in general and solar energy in particular for more related articles. Every part of our world is defined – and/or constrained – by energy. Our modern civilization – something you might think of as being all about computers and the internet, or perhaps all about big cities and high-rise buildings, or perhaps jet planes and satellites – has one universal thing at the root of every part of it – energy. Try and think of any part of your normal life in which energy is not an important part. Energy makes your home warm in the winter and cool in the summer. Energy allows you to commute to work. Energy enables you to work on the 10th or even 100th floor of a building. Energy is converted into food, is used to transport food to your local supermarket, to store it there, and more energy is used by you to cook the food. Energy also brings you the water you need, and takes away the sewage you don’t need. Energy powers your cell phone and computer, and also the internet they connect to. Energy comes in many forms, of course. In earliest times, energy was primarily either in the form of our own personal labors, or in the form of fire. In time, we harnessed additional energy sources – we used animals to magnify our own personal energy outputs, and of course, we started to develop new ways to channel the energy of a fire – the external combustion engine (or, if you prefer, the steam engine) was the breakthrough that allowed for the Industrial Revolution, and subsequently for the settling of the United States, and we know all about the internal combustion engine’s subsequent impacts. Okay, we will skip the rest of the history of energy development, and simply say, for our purposes, the biggest challenge we have to face in a Level 2 or 3 situation will be the loss of our usual energy sources and the critical energy shortage that will result. There’ll no longer be gas at the gas station, or electricity in our sockets at home, or other sources of energy in other places, either. Our lives will fall apart due to the lack of energy to maintain, manage and improve our lives. So one of the most important preparations we have to make is to identify suitable sources of energy to carry us through any future Level 1, 2 or 3 situation. A level one situation is relatively trivial, and we won’t dwell on that here, but when we start to think about extended level two and three scenarios, we realize that a supply of spare batteries, some stored petrol, a generator, and an outdoor barbecue with a couple of spare propane tanks isn’t going to take us very far. Sure, we could grow our fuel dump and instead of 5 or 50 gallons of petrol, look instead at 500 or 5,000 or more gallons, and probably of diesel. Instead of a couple of standard 5 gallon propane tanks, we could install a below-ground series of 1,000 gallon tanks, even 10,000 gallon tanks. We’re not saying you shouldn’t do all these things, but these are non-trivial preparations, costing probably tens of thousands of dollars and requiring large storage spaces and possibly needing special permits to store large quantities of fuel. And, even if none of these challenges are problems to you, there’s still the ultimate problem that you’re merely delaying – no matter how much fuel you store, sooner or later, you will run out, and then what do you do? So, we preppers are always keen to find renewable energy sources. The three most common are hydro, wind and solar. Hydro has very limited applicability for most of us, and wind power is not often a practical consideration either. Even if you are fortunate to be able to add a wind powered turbine to your retreat, you will need to plan for ongoing repairs and maintenance and the replacement of stressed moving parts from time to time. Which leaves us with the other common source of renewable energy – solar cells (or, if you prefer, PVs – photo voltaic cells). If you live in an apartment with no roof and only a small amount of northern facing windows, then you probably can not get much value from solar power. But if you have a reasonable amount of sky-facing space, and ideally giving you an unobstructed view of the horizon for 150+ degrees from east, rotating down through south and over to west, then solar might be a good choice. Solar cells continue to drift down in price and to drift up in functionality and efficiency – that is, a given size of solar panel seems able to generate more and more power with each new generation of solar cell technology, while costing less and less. That’s not to say they are a cost affordable alternative to normal utility provided electricity and natural gas in normal times, but in a Level 2/3 situation, they become an affordable and essential energy source. Of course, they only work when the sun is shining (well, they’ll still generate power at a diminished rate on cloudy days, but not at all when it is night), so they need to be considered in conjunction with some type of energy storage system (ie, for most of us, batteries). Perhaps the most appealing part of a solar array is that the solar cell panels have a long lifetime. They are typically warranted for periods of about 25 years (although the warranties usually allow for some diminution in power output over time, but typically warranted to still generate 80% or more of their initially rated power after 25 years). With no moving parts, there’s almost nothing to maintain (you need to keep them clean, and their associated battery bank and charging electronics may need maintenance) and almost nothing to go wrong. Indeed, some solar cells are still working perfectly after 50 years, so even the 25 year warranty might be conservative. That’s not to say that the panels are (literally) bullet proof, and indeed, a very remote possible source of damage might be hail. But the slope on your panels will help deflect hail rather than directly absorb its impact, and assuming your hail never gets powerful enough to start smashing roofs and car windshields, your solar cells should be just fine (see this story about one exception to this, but it involved hail the size of tennis balls). Clearly, the more sunlight, the more power. But let’s start off with an assumption – bright sunlight – and then understand how much power we can get from normal bright sunlight. PV cells these days seem to typically be about 14% – 15% efficient. Planners work on the basis of the sun providing about 1000 watts of power per square meter on a bright sunny day – an interestingly round figure, but one that is good enough for many planning purposes. A square meter is about 10.8 square feet, so if you prefer, you can also say the sun provides about 93 watts per square foot. This means that a PV cell with 15% efficiency will convert that 1000 watts of solar power (per sq m) into 150 watts of electrical power (or about 14 watts psf). This 15% efficiency is massively better than nothing at all, and the sunlight is free to start with. New types of solar cell are promised in the future, with higher efficiency ratings (up into the mid twenties and possibly even over 30%), and some are even available now, but they are very much more expensive, and may be more fragile and less long-lived, so for now, you are best advised to stick with traditional technologies. Now that you understand the typical maximum power output to expect, the next issue becomes how much you’ll actually get in real life. Nowhere in the US has bright sunlight all day every day, and even those places with high levels of bright sunlight still have a mix of day and night each 24 hour period. There are some very useful maps created by the National Renewable Energy Laboratory which show you, for your specific part of the country, how many equivalent hours of bright sunlight a day you can expect, both month by month and a summary for the entire year. Use the PV Solar Radiation (10km) monthly map series for the most accurate and detailed information. You’ll see that most of the US seems to average, over the course of an entire year, at least 5 kWhrs of sunlight per sq m per day. Another way of putting that is to simply say ‘at least five hours of bright sun in total, even if spread over more than five hours of daylight’. Remember to now allow for the 15% or so efficiency in converting this sunlight energy into electrical energy, and be sure to look at winter month figures as well as summer, and you can start to get a feeling for how much you’ll actually get from your solar panels. If you’re up in American Redoubt territory, you’ll see you’ll be struggling to get much more than 2.5 hours of bright sunlight equivalent each day in winter. You’ll need a lot of panels to get any appreciable energy in winter in such locations. In other words, if you have a solar panel setup that is rated for, say, 10 kW, and you’re in a part of the country with 5 hours of sunlight a day, you can expect your 10 kW panel to give you almost 50 kWhrs of power per day. Needless to say, it is best, when considering how much power to get from your setup, to always be conservative and plan for worst case rather than best case scenarios. Make sure you understand the methodology being used to quote power outputs and total energy generated from systems, because these are more likely to be best-case scenarios. Please see our article ‘How Much Solar Power Do You Need’ for a more detailed look not just at power outputs from solar panels, but at the power requirements you are likely to have in your retreat and how they can best be handled via solar power, and, if helpful, our article explaining the difference between power and energy, between watts and watt hours. Here’s something we learned ourselves, when trying to install a solar panel system in an area that had trees that would cast partial shade patterns on some of the panels. You need to have even sunlight on each entire panel, and ideally on the complete multi-panel structure. If you don’t, you’ll find that a small amount of shade, on a small part of one panel, might be enough to cause the entire panel to lose half its power output, and possible to reduce its power output completely down to zero. Indeed, and here’s the really surprising thing – a panel that is evenly shaded will probably generate more power than a panel that is half in the shade and the other half in full sunlight. This is not something you’d guess at (which is why we mention it). The reason for the disproportionate impact of partial shade is the way the panels are made up of the separate cells within them. While you probably think of your total solar installation as being a collection of panels, you also need to appreciate that each panel is a collection of individual solar cells. These solar cells are joined together in an electrical series (and sometimes might have several of these series strings of cells all connected together in parallel), so as to take the voltage generated per cell (usually about 0.5V per cell) and have this combined to create a more useful voltage (the higher the voltage, the less power loss in the wiring and the less thick the wiring needs to be) to actually work with. If one of the cells in the series of cells all joined together gets less sunlight than the others, then instead of generating some power, it can end up in effect ‘sucking’ power from the other cells, and that may cause safety circuits in the panel to then drop the voltage across all the cells in the string to prevent this from happening. You can sort of think of it as the difference between a band playing a tune all in time with each other, and the disproportionate chaos that results if even one person in a large band starts playing wrong notes. This is why you want to have even sunlight on the entire panel, so all the cells within it are working together equally. Be sure to locate your panels appropriately. The same problem usually affects multiple panel setups, too. Normally the panels are also connected in series, and if any one panel (or part of one panel) gets less sun, then all the panels suffer. Note that new micro-inverter circuitry can reduce some of these impacts, and in general give a better ‘yield’ of usable electricity from a given amount of sunlight on the panels. Now for an interesting extension of the concept of solar ‘power’. Up to this point, we’ve been considering solar power in terms of photo voltaic cells that turn sunlight into electricity. But there is at least one scenario where there is a better way of harnessing the sun’s energy. That is when you want to simply heat something up. Providing hot water, or heating your home in general, requires a great deal of energy to start with (heating up 10 gallons of water from 45 degrees to 95 degrees to give yourself a five-minute shower with warm/hot water, for example, requires 1.22 kWh of electricity. Or, to put it another way, a full half charge cycle of a 400 Amp hour 6 Volt battery, just for one five-minute shower. It is more efficient to heat the water directly through a solar water heater than it is to first generate electricity, then store it in a battery, then subsequently route it to the water heater and convert it to heat. Solar water heaters typically cost slightly more than half the cost of solar power generators, for a similar power output, and whereas you have additional costs for batteries, etc, with the electric power system, you don’t have these at all for the solar water heating (the hot water becomes your ‘store’ of energy). Amazingly, solar water heaters can still create hot water for you, even if the outside temperature is very cold. On a bright clear winter’s day, you might have below freezing temperatures, but still be getting hot water from your solar water heater. So it is sensible to have both solar (electric) power panels and a solar water heater at your retreat. That will save you substantially, particularly in terms of batteries, and also gives you the added benefit of two separate power generating systems, albeit both dependent on the sun. There are also several different styles of solar heating that can be used to heat the air inside a retreat. The simplest of these is, of course, a glass window. Ideally, you’ll design and build a system that gives you full energy independence, and allows you to enjoy an energy intensive lifestyle, even in an extended ‘grid down’ Level 2 or 3 event. But if you want to start off simply and do a ‘proof of concept’ installation, there’s no reason not to do this. Anything is better than nothing. You can buy complete systems that include the panels, some type of mounting system, wiring, distribution panel and an inverter (to convert the power from the DC that comes from the panels to regular 110V 60 Hz AC that your appliances use). This type of simple system (a ‘grid-tied’ system) works when the sun shines, and doesn’t work when the sun doesn’t shine. The next step up from that is to add a charge controller and a bank of batteries. Now your panels can either be directly powering your appliances, or, if there is spare power, can be using the power that is coming in to charge up some batteries. When the sun goes down, your system automatically switches over and now draws power from the batteries to continue supplying your home with 110V AC power, and automatically switches off when your batteries have used up the optimum amount of their charge. More sophisticated systems can interface with your regular electric power supply (assuming it is available), so that you first use your own solar power and only after that use the utility company’s power. Many states allow you to now ‘run your meter backwards’ and sell any surplus solar power to the utility company. Even more amazingly, some states will require the utility company to pay you more for electricity they buy from you than the cost they charge you for the electricity you buy from them. But we’re talking simple installations to start. A simple ‘grid-tied’ system that is capable of generating about 1 kW of power in bright sunlight will probably run you just over $3,000; more if you have someone do the installation for you, and if you add a battery bank to this for off-grid operation, then your cost will probably double. These costs may qualify for a 30% federal tax credit, and maybe there are state and local programs to further reduce your net cost. There are lots of specialty stores that sell solar power systems, and of course, you can also browse through Amazon (here is just some of the gear they sell ) too. There is little economy of scale with solar systems. You may get a lower rate per panel when buying ten or twenty or more panels at a time, and if you are using a single inverter rather than micro inverters for each panel, then there might be some savings there, but in general, if you get a system four times as large as a different system, then the cost will be close to four times as much too. Our point here is simple. You can get a fairly basic system for under $5000 and a good system for under $20,000. Ideally you want your panels facing south, on an incline the same number of degrees as your latitude north of the equator. An easy way to align the bank of panels is to place a stick on them, sticking up perpendicular from the panel surface. Then at exactly midday (or 1pm during daylight saving hours) align the panel so the stick casts no shadow. If you can’t get it exactly right, don’t worry. A 15° misalignment only reduces the power generated by perhaps 3.5%. Panels are typically mounted on the roof of a structure, but there’s no reason why this must be so other than the good sense of using a mounting structure that is more or less already in place. If you are mounting panels on a roof, it pays to make sure the roof itself, underneath the panels, has a goodly life remaining in it. If not, perhaps you should first replace the roof before adding the panels above it. If you are placing panels on the ground, consider if you need some stand-off height so that winter snow won’t reach up and obscure the bottom of any of the panels. Wherever you choose to mount your panels, try to keep the cable runs as short as possible from the panels to your retreat’s main electrical supply area. Longer cable runs mean wasted energy through resistance in the cables. You’ll want to be able to regularly access the panels for cleaning purposes, so consider that. If you have a very large array of panels, maybe you want to have some walkways in them to make it easy to reach over and clean dust, dirt, excrement, leaves, moss, etc off the panel surfaces. The vast majority of solar panels are fixed, but it is possible to get panels that move to maintain an angle more closely perpendicular to the sun. The sun travels through an arc each day, both horizontally and vertically, meaning that for most of every day, the energy collection from the solar cells is not as efficient as it theoretically could be. A system that aligns itself to point more closely at the sun can generate more than 20% extra energy per day. But the added complexity and cost of systems that track the sun, either in a horizontal or vertical axis, or even in both axes, generally seems to argue against their implementation, and they are harder to mount on a rooftop. It is usually cheaper and easier to take the money that a tracker type system would require, and to spend that money on simply increasing the total array size and number of panels, while at the same time avoiding the added maintenance issues and complications that the tracker units would otherwise require. So, Why is Solar so Good for Preppers? 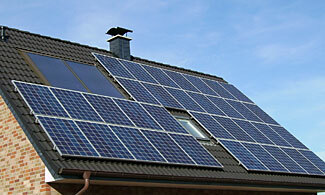 Solar is an excellent source of energy for several reasons that appeal to preppers. It is cost-effective (compared to other renewable energy sources) and can be deployed widely across the country. It is long-lived and reliable and low maintenance, and once it is installed, requires no special skills to keep operational. It is also ‘low profile’ – there are no sounds or smells or sights or smoke associated with solar power generation, unlike wind turbines, generators, or fires. It is easy to add to a retreat, and easy to grow and expand over time. While it is dependent on sunlight, you can adjust your array size to reflect the best and worst case scenarios for the availability of sunlight at your location. The less sunlight, the larger your array and the greater your battery reservoir. When designing a retreat, it is helpful to have an east-west roofline so you can fill the south-facing roof side with solar panels for electricity, and solar heating units for your hot water too. If you don’t yet have any solar power generating resource, you should definitely get some.